Delicious seafood dish that will have all the family coming back for more! First melt the butter in a saucepan and add the flour, stir using a wooden spoon until the mixture becomes pale, be careful at this stage not to burn the mixture. Pour the cold milk onto the roux (cooked flour) stirring continuously with a whisk for about 2 minutes or until thickened. Then add the mustard, the lemon zest and half of the cheddar cheese. Stir to combine and season with some salt and pepper. On the side, fill the tubes with some seafood pieces. Scatter the leeks into the base of the dish, then pour half the béchamel over it. Add the seafood filled cannelloni and any remaining seafood. Spoon the remaining béchamel over the pasta tubes. Add the left over cheese then place a slice of lemon on top. Keep in the fridge until needed. 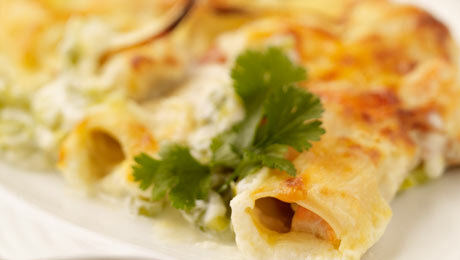 Bake in the oven for 15 – 20 minutes until the cannelloni are softened and the top is golden brown.